Let’s take a moment to remember that the symbols our brains use to communicate with us in our dreamstate are largely present to prevent us from receiving too much truth at once, and to keep us pleasantly restful. If you apply this understanding to the world of art it would make sense that the most beautiful performances might not be the most direct. Attending the Itinerant Performance Art Festival at Last Frontier in Greenpoint, ancient meat hooks hang from the high ceilings, decorated with bells and flowers. Sungjae Lee is slathering himself with thin layers of green clay, gaining mass and wrinkles over several hours, a statement on aging I think. Cristina Silvio, dressed in unpleasant flesh colored spanks, is nailing her long brown hair to a board, a few locks at a time, until she is quite bound to it, evoking simultaneously Mary Magdalene and Jesus Christ. The trend in performance art seems to be a return to the body, the opposite of modern life, a reaction to New York. I have come to see Claire Zakiewicz who I know to be a great world traveler, as well as an accomplished painter. These two facts together explain how she has been moving farther and farther away from her own canvas through experiments in remote painting. First, blindfolded painting took her away from conscious control. Then she made a magical pair of sunglasses taped over with white medical tape to allow her to see back into herself. 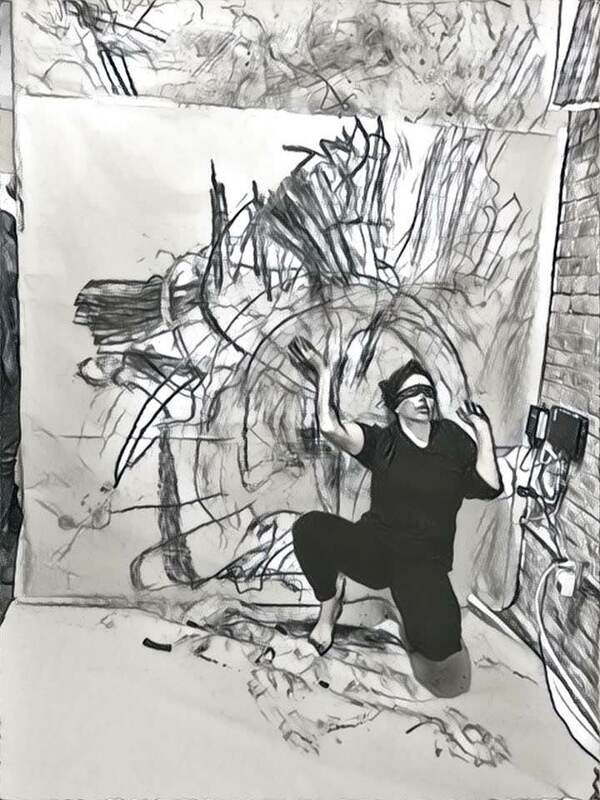 During one notable performance she laid a canvas on the floor and daubed paint on blindfolded dancers who danced to my live accompaniment. Her most recent collaboration with Siw Laurent takes her even farther from the canvas. 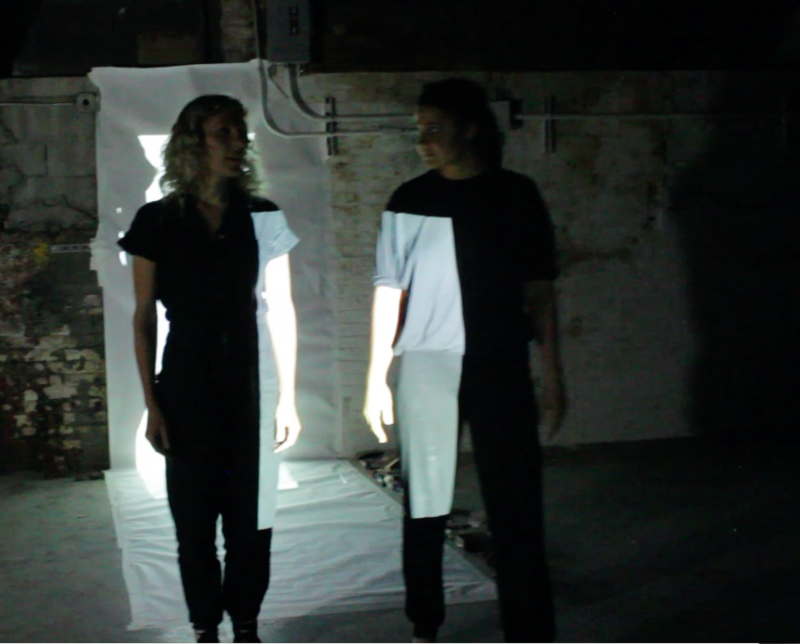 In a room where other artists are focused on the body, Claire stands behind her DJ table, creating music for the purpose of moving her proxy painter, Siw, whose operatic voice echoes through the building. Siw holds small black charcoal bars that match her blindfold. She makes black skyscraper marks on the white paper and screeches in tongues. She holds charcoal between her toes, as if to free herself as much as possible from conscious control. Claire then alters the music, speeding it up to a scream. When this chaos clears there are voices in the noise, reading poetry by Dannie-Lu Carr “Salty salty salty/ salty wounds to heal/ crashing waves/ salty air cleansing the demons from my mind/ salt in the soul.” Siw’s mouth has become black from charcoal. Some of her wild gestures mark the paper -- others do not. Now she is on all fours making animal noises. Now she is pointing at nothing and speaking in tongues. Siw is singing over a Steve Reich sample. Siw is manipulating invisible marionettes. Siw is Claire’s marionette. She removes her blindfold and reenters the world. They bow. The crowd applauds.